The Russian military continues to boost its anti-access/area denial (A2/AD) capabilities. The Russian military took delivery of the second S-400 Triumf advanced Air Defense System (NATO reporting name: SA-21 Growler) regiment in 2017 this week, according to local media reports. Russian defense contractor Almaz-Antey handed over the new regiment to the Russian Ministry of Defense (MoD) on October 23. “The delivery ceremony took place at the Kapustin Yar practice range in the Astrakhan Region in south Russia. The acceptance/delivery trials have passed successfully,” the Almaz-Antey press office said. The first S-400 regiment was handed over to Russian military in September. Two more S-400 units are expected to be inducted into service by the end of the year. The Russian military currently operates 18 (some sources indicate 19) S-400 regiments divided up into 39 battalions. One S-400 regiment is divided into two battalions. Each battalion consists of up to eight launchers and 32-112 missiles in addition to acquisition and engagement radar systems and a command post. In comparison to its predecessor, the S-300, the S-400 air defense system features an improved radar system and updated software; it can purportedly can fire four new types of surface-to-air (SAM) missiles in addition to the S-300’s 48N6E, a vertical tube launched, solid fuel, single stage SAM with an estimated range of 150 kilometers (93 miles), and the improved 48N6E2 missile with a reported range of 195 kilometers (121 miles). One of the S-400’s new missiles is the so-called 40N6 SAM with an estimated operational range of 400 kilometers (248.5 miles) and an altitude of up to 185 kilometers (607,000 feet). The missile is reportedly capable of exo-atmospheric interception of intermediate-range ballistic missile warheads in their terminal phase. However, it is unclear whether the weapon is operational in Russia yet and no images of the 40N6 SAM have surfaced so far. 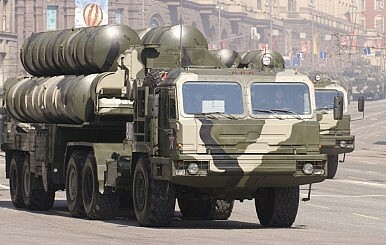 The S-400 is also armed with an improved variant of the 48N6E2 with an alleged range of 250 kilometers (160 miles). The air defense system can also fire two additional missiles, the 9M96E and 9M96E2 with respective ranges of 40 km (25 miles) and 120 km (75 miles). Improved S-300 air defense systems such as the S-300PMU-2 Favorite (sold to Iran), can purportedly also fire the 9M96E and 9M96E2. The Russian military last conducted a missile defense drill involving S-400 units in September. “During a tactical exercise the crews of air defense and radio-technical forces and a division level command post practiced redeployment to the Ashuluk proving ground and counter-measures against an enemy air raid and carried out launches of missiles against targets,” the Russian MoD reported. According to the defense ministry, the S-400 unit successfully destroyed all simulated air targets.